Margaret Mitchell was on her way to see a movie when she was struck by an off-duty cabbie driving too fast down Peachtree Street one night in Atlanta in 1949. Her death five days later cemented certain facts of her life, most notably that her first novel would also be her last. But she had made the most of her debut: in its nearly 1,500 pages, Gone with the Wind captured the romance and demise of America’s Old South like none other before or since, sold one million copies within six months of its publication, secured a Pulitzer Prize for literature in 1937, and inspired one of the most beloved motion pictures of all time. Little was said about Mitchell’s death one recent evening in Atlanta, when several dozen of her fans—Windies, as they like to be called—gathered for a tour and graveside toast at the historic Oakland Cemetery, where Mitchell is buried and where her plot is among the most visited. The soiree was one of many held in and around the city this month in honor of Gone with the Wind’s seventy-fifth anniversary. 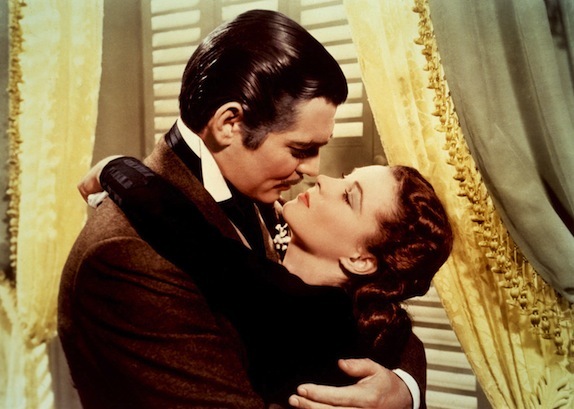 The crowd was almost entirely female; Gone with the Wind handbags abounded, and at least one wristwatch bore the iconic image of Rhett and Scarlett’s smoldering onscreen embrace. Though most wore street clothes, some ladies had arrived in 1860s-ish period dress, their dedication eclipsing both the melting late-afternoon heat and the outfits’ flagrant anachronisms—clip-on chignons, hemlines revealing reputation-shattering amounts of ankle, synthetic fabrics not invented in Mitchell’s lifetime. Until recently, I was only vaguely acquainted with Scarlett O’Hara. I was raised in Tennessee by multigenerational Southerners and grew up visiting Civil War battlefields on field trips and family vacations. I went to college in Atlanta—Mitchell’s hometown and the setting for most of her opus—and have lived here ever since. But my knowledge of Gone with the Wind was only sufficient enough to know that Rhett Butler’s most famous line from the movie perfectly summed up my sentiments regarding the whole franchise: frankly, my dear, I didn’t give a damn. But when the local hubbub around the book’s diamond anniversary pushed me to crack open the tome, I was drawn in immediately, as if the story had been patiently waiting for me all these years. Mitchell’s descriptions of the north Georgia landscape—the hills, the red clay, the haunting woods—were chillingly accurate, clearly borne of her own great love for the land. But I fell hardest for Scarlett’s stormy inner monologue, where propriety and rebellion and deep, irrational passion engage in battles that span years, lovers, births, and deaths and one hell of a war. The film version is dense with plot and triumph and tragedy, but it seems hollow without full access to that precious, private world. I am still not sure if I hate or love Scarlett—I am not alone in this, I’ve learned from friends who were less slow to pick up the book—but after just a short time I felt like I knew her, and it was my desire to pay tribute to her and her creator that landed me here, sweating elbow to elbow with a group of twenty or so Gone with the Wind enthusiasts and five members of a German television crew in a cemetery on the hottest day of the not-quite-summer so far. Our guide was a silver-haired woman dressed in approximate 1940s garb, a tribute to the author, and the Windies and I followed her as she tottered backward down dirt paths. We slicked sweat from our foreheads and pondered the lives and deaths of Mitchell’s distant relatives and notable Atlanta contemporaries. Conspiratorial murmurings rustled through the group as our guide pointed out the graves of possible templates for some of the story’s most beloved characters: the grandfather whose jet-black hair may have inspired Rhett Butler’s inky coiffure; the valiant Confederate physician with an overwhelming likeness to the actor who played Dr. Mead onscreen; the madam (now resting in an unmarked grave under a stately magnolia) whose ignominy lived on in the flame-haired Belle Watling. The sun bore down and in the wavering heat I found myself searching for familiar names on the headstones, names of characters I knew weren’t real. I thought perhaps I might even see Scarlett herself, perched primly on her own tombstone. I imagined offering her my much-delayed respects. I had forgotten which world I lived in. Mitchell’s finely-wrought characters and the sheer time commitment reading the book demands make these lapses difficult to avoid, and I wondered if many of the women around me had suffered similar spells. Now, their themed accessories and conspicuous utterances of “Fiddle dee dee!” (movie-Scarlett’s signature phrase) seemed like more reasonable tributes. Even sweating through period garb seemed a saner option. Well into the tour, a woman in a stately, lace-edged red-velour ball gown paused to rest on a stone wall and took a grateful slurp from a giant Styrofoam cup carried by her boyfriend, who was dressed as a young Atlanta gentleman circa 2007, clad in jeans and a polo shirt. It was then that I realized how closely the signs of my Scarlett mania resembled the symptoms of dehydration. And so I thought it best, when we finally reached Margaret Mitchell’s final resting place, to decline the champagne offered to me for the graveside toast. The German TV crew set up at one corner of the plot and turned their cameras on my tour mates, who raised their plastic flutes at the command of a gray-suited, white-mustached fellow at the front of the crowd. An antique folding screen, chair, desk, and typewriter had been arranged on the grass, presumably to simulate Mitchell’s workspace, and the mustached man stood amid the tableau as he said hello and announced the arrival of a special guest. The Windies giggled and gasped as a petite woman emerged from behind the screen, her slim frame draped in a pink floral day dress, her brunette hair short and curling about her face. “It gives me the humbles to see y’all still care about my little ole book all these years later,” the proxy Mitchell cooed, then clarified that while she she was unable to give autographs, she’d be happy to stay for photos. The women in costume approached her first and, one after another, stood by her side and matched her demure smile—unblinking, self-appointed emissaries from two different centuries posing for snapshots in a third. I turned and left them in search of water. I was nearly home before I realized I never saw the grave. Rachael Maddux is a writer and editor living in Decatur, Georgia.